Grammatically challenged musician Will.i.am has been showing off his own unique sense of style, by unveiling a customised version of Lexus' new NX crossover at a launch party in Paris. The Black Eyed Peas star has teamed up with the Japanese luxury brand to front the advertising for its new vehicle, which sees Lexus enter the premium compact SUV market for the first time. Revisions to the NX, which is pitched as a rival to the upmarket Audi Q5 and BMW X3, include styling tweaks inside and out, plus additional equipment. Unfortunately,unlike rival brand Infiniti's tie-up with F1 champion Sebastian Vettel, the Will.i.am NX is purely a design study and will not be offered for sale. It's based on the NX 200t – a model that won't be available in the UK until early next year. Fitted with a 2.0-litre turbocharged petrol engine, it develops 235bhp. A hybrid version – the first in its class – badged 300h, is available to buy now. Externally, the NX wears a wide body kit and sits on huge 22-inch wheels for greater visual aggression. It's finished in a unique matt pearl white paint not available on regular models, while exterior trim pieces are finished in a carbon vinyl wrap. The standard NX's generous toy count has been further added to with four 180-degree cameras that can capture panoramic video and photos as you drive, which can be displayed instantly on a compatible smartphone. It's joined by Lexus' new wireless phone charging tray, which thankfully is available across the range. Will.i.am has had a hand in the interior styling, too, with the Nappa leather seats embroidered with his 'willpower' logo. He's even gone as far to spec the floor mats in leather and brushed aluminium. 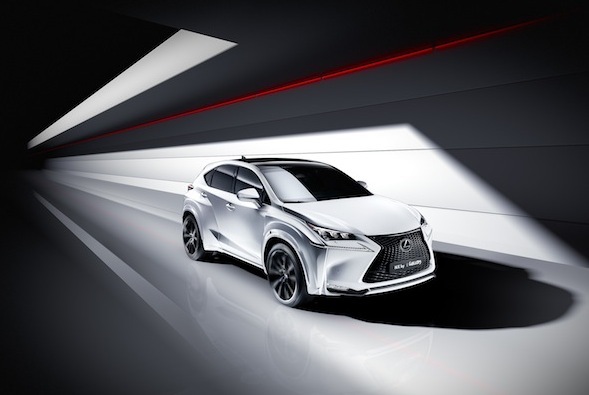 The music mogul, and judge on BBC's 'The Voice', is seen by Lexus as a great ambassador for the new NX due to his global appeal, particularly with "younger, urban and design oriented" customers the new car is aimed at. Speaking on his new creation, Will.i.am - who's no stranger to designing cars - said: "I'm honored to be launching my bespoke Lexus NX F Sport in Paris –this car is super fresh and incorporates my personal style. My point of view is the best kind of design will encourage other people to interpret that design." What do you think of the Will.i.am NX? Have your say in the comments section below.